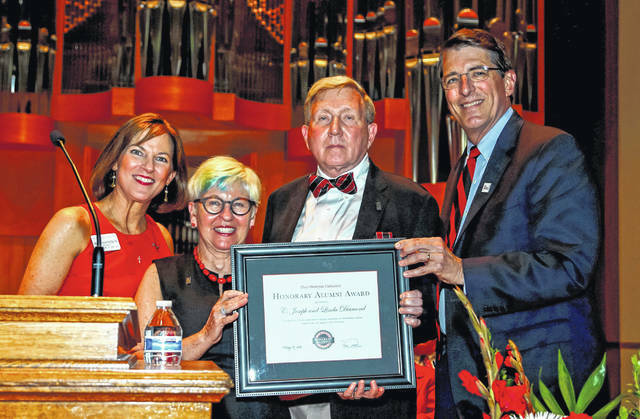 Ohio Wesleyan recognized Linda and C. Joseph Diamond, center, with an OWU Honorary Alumni Award during Reunion Weekend. Presenting the award to the Delaware couple are Sheila Fagan Plecha, Class of 1984, and President Rock Jones. The award was presented to the Diamonds by university President Rock Jones and Alumni Board of Directors President Sheila Fagan Plecha, Class of 1984, during Ohio Wesleyan’s 2018 Reunion Weekend. The Diamonds’ ties to Ohio Wesleyan include creation of an endowed scholarship in 2016 to aid Delaware County students with an interest in the arts, sciences, or humanities. They also are members of the Bishop Backers executive committee and of the Tower Society, which recognizes donors who make estate gifts to the university. In 2017, the OWU Athletics Department awarded the Diamonds with its Town-Gown Award by in recognition of the couple’s longstanding relationship with, and outstanding support of, Battling Bishop student-athletes and programs. The Diamonds’ ties to the Delaware community are equally significant and strong. Joe Diamond is a founding member and past president of Main Street Delaware and serves on its Design Committee. He also is a founding member of the executive board of the Strand Theatre and Cultural Arts Center and volunteers as its facility manager. He is a former assistant preservation officer for the City of Columbus, Ohio; planning director for the City of Oberlin, Ohio; city planner for Delaware, Ohio; and regional planning director for Delaware County, Ohio. Today, he is the principal and owner of Diamond Design and Planning, which specializes in downtown revitalization, historic preservation, and master planning. Linda Diamond taught elementary school for 20 years, and owned and operated Beehive Books for seven years. She is a former executive director of the Ohio State Board of Sanitarian Registration and a former director of communications and development officer for the Delaware General Health District. In 2001, the Delaware Area Chamber of Commerce recognized her as its Citizen of the Year. Together, the Diamonds own Rosebud Properties, a real estate holding and management company that specializes in historic commercial and residential properties. In 2006, Rosebud was named the Delaware Chamber’s Small Business of the Year, and it was recognized five years in a row by Main Street Delaware for improvement projects in downtown Delaware. Rosebud also has been honored with Best Historic Commercial Restoration in the State of Ohio and 2011 Spirit of Main Street awards from Heritage Ohio. Founded in 1842, Ohio Wesleyan University is one of the nation’s premier liberal arts universities. The private university offers more than 90 undergraduate majors. Learn more at www.owu.edu.